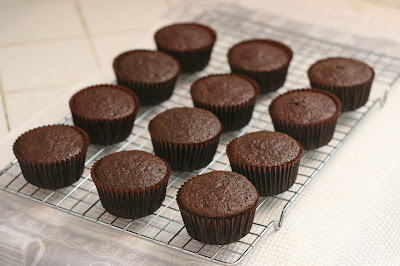 Today I’ll begin a series of posts that will cover (most) all of the basics of making cupcakes. A pretty cupcake is always a welcome sight at parties, or as a special treat. Before we can frost or decorate, we need a nice cupcake to start with, so let’s get baking! First, you need a good recipe. 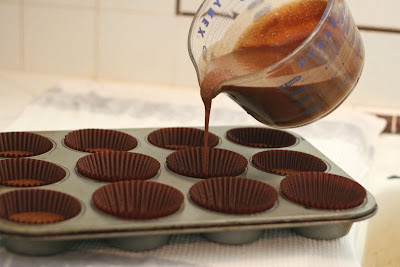 I rely on my favorite Chocolate Cupcake Recipe and Vanilla Cupcake Recipe the most often, but I have several other delicious options on the Cupcakes page. You are certainly welcome to use a box mix, or other recipes as well, most of the tips below will apply to any recipe or mix you use. 1. Follow directions. I know… I’m sorry I have to say it, but it’s true! Recipes are written using certain techniques, each for a reason. If you don’t measure your ingredients properly, or omit ingredients, or over or under mix your batter, you should expect less than desirable results. 2. Preheat your oven. Don’t place your cupcakes in the oven until it is fully pre-heated. The heating element in your oven is extra intense as it is pre-heating, if you put your cupcakes in while pre-heating, the cupcake bottoms may over bake. 3. Don’t over fill the liners. Most cupcake batters need the structure of the sides of the liners to rise properly. 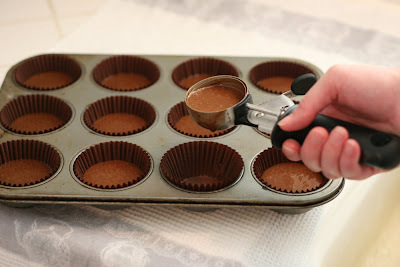 Overfilling your batter will cause the batter to spill over the edges of the liners as it rises, often resulting in flat or mis-shaped cupcakes, and a big mess. Follow the instructions for the recipe or mix you’re using, most recommend filling the batter about 2/3 full. (below) You can see the baked results. 4. Divide the batter evenly among the liners. It’s impossible to get exact same amount of batter in each liner, but if they can be reasonably even, the cupcakes will bake evenly as well. For thinner batters, I use a large measuring cup with a pouring spout (shown below) to pour batter into the liners, doing my best to fill them about 2/3 full. For thicker batters, a large cookie or ice cream scoop works great. I have a scoop that holds about 3 tablespoons of batter, and it works great for dividing the batter. 5. Check the cupcakes at the minimum baking time. If the recommended baking time is 18-22 minutes, check them at 17 or 18 minutes (just a quick peek, make sure not to let too much heat out of the oven). If the tops are rounded and no long appear wet, they may be done. Pull out the pan and use a toothpick to check for doneness if you’re unsure. 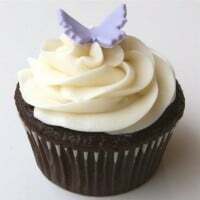 A toothpick inserted into a cupcake should come out with a few moist crumbs, but no wet batter. Over-baking the cupcakes, by even a few minutes, can cause them to be dry. Be carefully not to under-bake them either, the cakes need time to develop the structure to hold together. Cupcakes removed from the oven too early may never properly rise, or will sink in the center as they cool. 6. Cool cupcakes on a wire cooling rack, not in the cupcake pan. 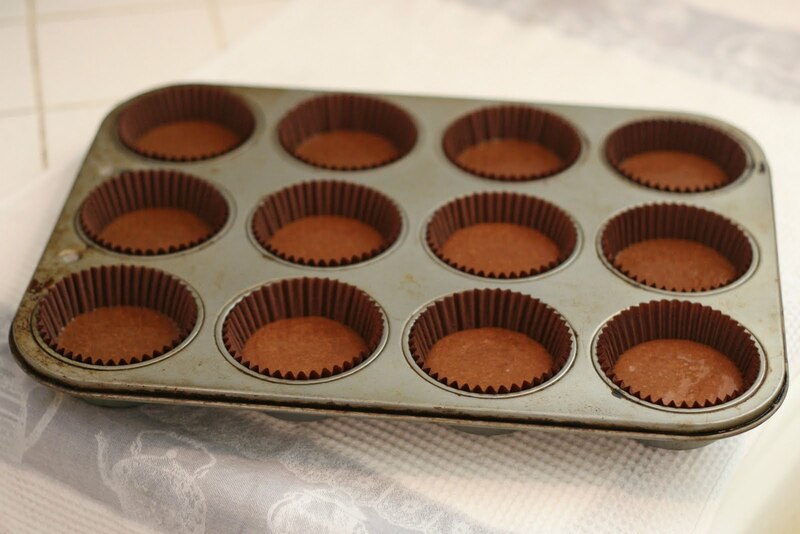 When you remove the cupcakes from the oven, allow to cool only a minute or so in the cupcake pan. Then use a potholder to hold the pan, and tilt it so you can remove the cupcakes and place them on a cooling rack. 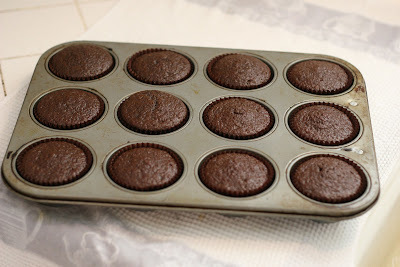 If you leave the cupcakes in the pan, they will continue to bake from the heat of the pan, and can dry out. 7. Store the cupcakes properly. Once the cakes have cooled, frost or cover right away. 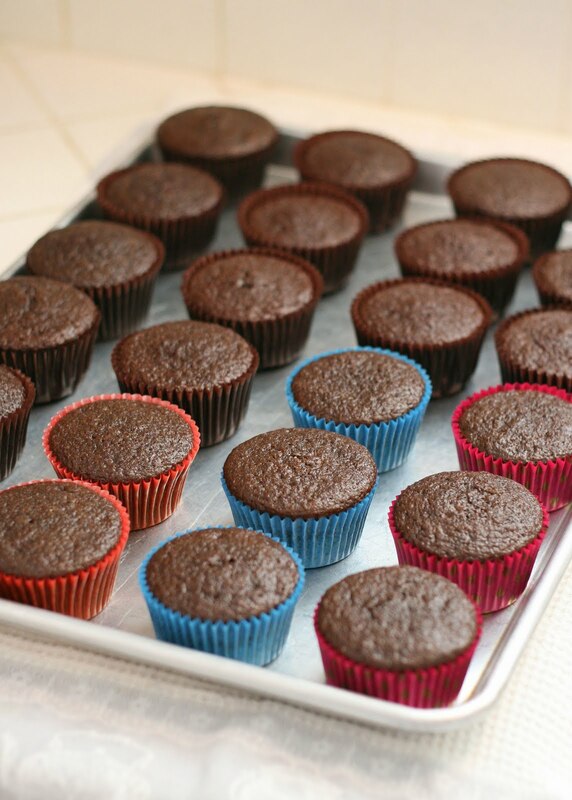 Cupcakes made from box mixes can be stored loosely covered, since they tend to get a bit sticky if stored airtight. 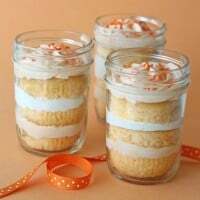 Most cakes made from scratch can be covered with plastic wrap, or in a tupperware type container. Most cupcakes are best if eaten the day they are made. 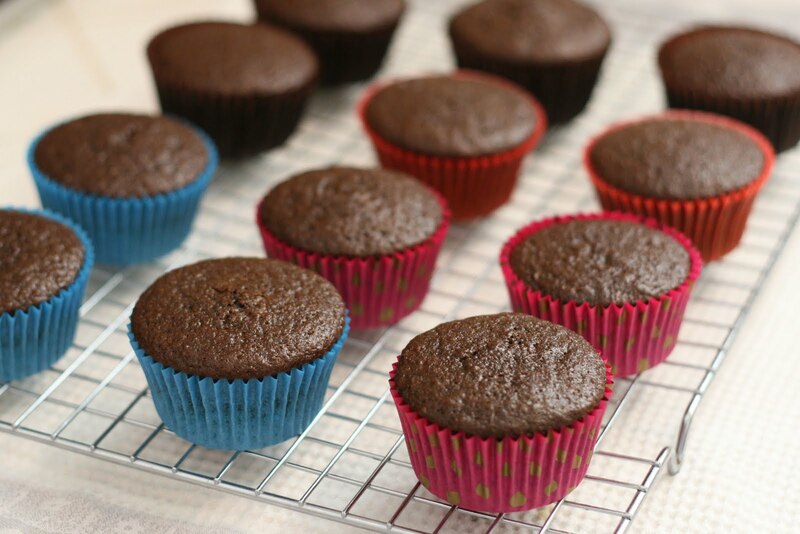 If needed, store the cupcakes up to 1 full day at room temperature, or freeze (wrapped well) until ready to use (defrost at room temperature). 8. With cupcakes, as with life… there are no guarantees. These tips will hopefully help you bake beautiful, delicious cupcakes, but much of baking is experimentation. I have made my share of over-baked, dry, ugly or otherwise sad cupcakes. I don’t have the answer to every possible baking dilemma… your oven, the weather, your ingredients… all play a part in the end results. In many cases, a swirl of icing and some sprinkles can cover quite a bit! Forgive me if I missed this information somewhere else on your site, which is BEAUTIFUL by the way!! 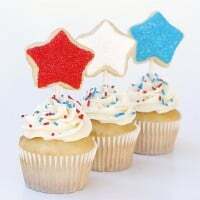 You have a pic of three cupcakes a couple of places on your site. One is at the very top of the page. They look chocolate with chocolate frosting and a cherry on top. I wonder if you can tell me where you get/got the “cups” they are baked in? I LOVE, LOVE, LOVE them!! When I saw them, my heart warmed remembering being a little girl going to work with my mom. At their water cooler they had these type of cups (but white of course). My sister and I would always run their immediately for a cup of water, but mostly so that we could play with the cup afterward, but I digress. I assume these are already a trend in the cupcake world and if they aren’t now, I’m sure they will be soon. I also assume they come in different colors, at least. Maybe even different sizes. Thank you, for sharing your gifts with the world!!! 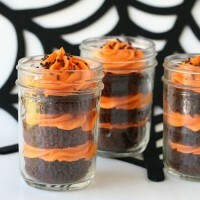 Search for Buttercream (brand) treat cups, that’s what they look like. If not that exact pattern then they have similar ones in the same style. Hi!! Love your website!! Can I use this recipe for a 6 or 8 inch cake? If so do I need to change the measurements and baking time? Do u take the cupcake paper off a muffin before bringing them to a party or let the people take their own paper off the muffins? I am making key lime MINI cupcakes for a church function. I have not made the nini size in a very long time. Any tips?? So I tried to be Martha Stewart for my daughter’s first bday and I filled the cupcake liners half way full but then found your website and filled them 2/3s ofbthe way- they’re currently overflowing in m oven. **crying emoji face** I don’t have the money to go buy new batter. Change your directions! 2/3s is too much!! !